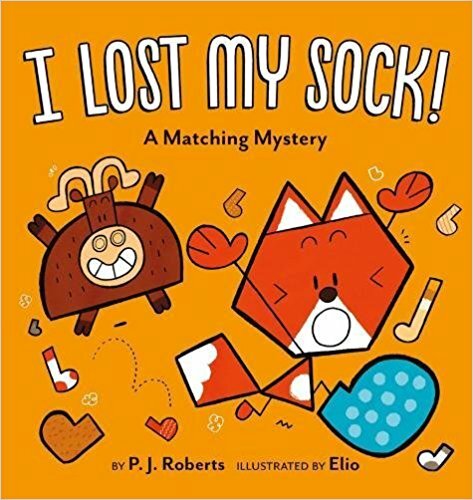 DESCRIPTION FROM THE PUBLISHER: So begins Ox’s ridiculous attempts to help Fox find his missing sock. He presents each new option just before the page turn so the reader has a moment to decide for him or herself whether Ox has, in fact, found Fox’s sock. At its heart, I Lost My Sock! is the story of a funny misunderstanding between friends. But it’s also about pattern, colour and shape recognition; comparing and contrasting; and object identification. Mastery of these skills enriches a child’s vocabulary, prepares him to understand letters and numbers, and helps him gain a better sense of the world around him. Elio’s bold, geometric character designs further reinforce the early math concepts hinted at in this book.